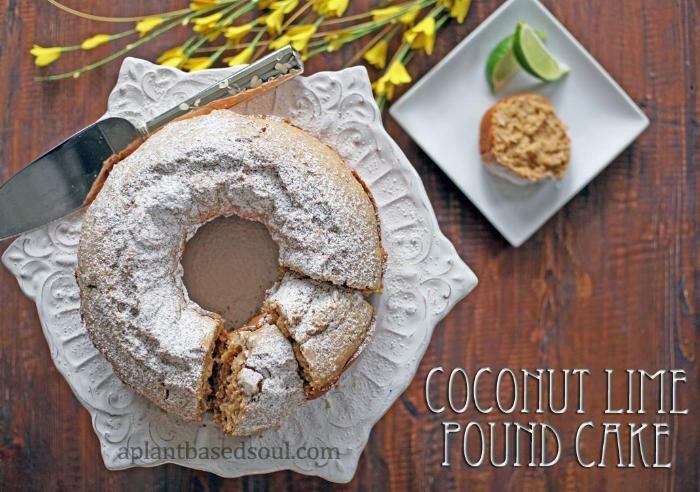 A new take on traditional poundcake, sweetened with banana and coconut with a hint of lime. 2In a stand mixer, beat butter, oil, and coconut sugar until smooth and creamy. 3Add chunks of banana, coconut and lime zest. Continue to beat on low. 4Add lime juice, baking powder, and nut milk of choice. Continue to beat on low. 5Slowly add flour, one cup at a time until a smooth thick batter has formed. 6Prepare a bundt pan by greasing with non-stick spray or coconut oil. Pour batter into pan and smooth the top with a spatula. 7Place in the oven and bake for 50 minutes or until a toothpick comes out clean. 8Let cool in pan for a few minutes and then transfer to a wire rack to continue cooling. 9Dust top of pound cake with confectioners sugar if desired.